Charlie Stannard, 19, from London and Heather Thomas, 18, from West Yorkshire are celebrating today after both winning a place on Leg 6 of the next race following a national competition run by the Andrew Simpson Sailing Foundation. 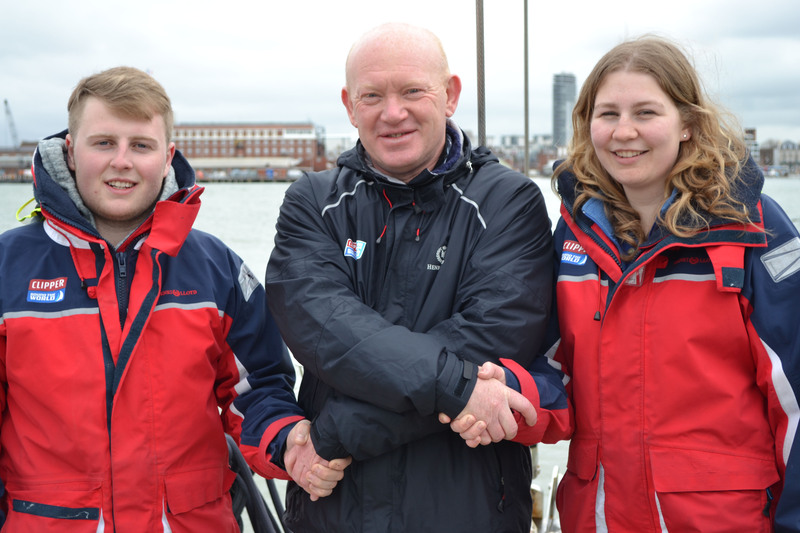 Having been announced last December as finalists for the competition, both had been on their Level 1 training trial and were expecting to return to shore today to find out which of them had been selected for the overall prize. However there was a surprise in store when they received the exciting news from their training skipper Darren Ladd, that both had been awarded a race place.Sir Robin Knox-Johnston explained: “The Andrew Simpson Sailing Foundation ensures young people are given their best opportunity to achieve their potential through sailing so I am very pleased to support their hard work and make the decision to award both Charlie and Heather with a place on Leg 6 of the Clipper 2015-16 Race. Charlie was introduced to sailing through the Docklands Sailing and Watersport Centre (DSWC), a sailing charity in Tower Hamlets which provides affordable sailing programmes for young people. After first coming to the centre for ‘something to do,’ Charlie caught the sailing bug and competes regularly in dinghy racing events in the UK and abroad. He also volunteers, mentoring younger competitors, and runs weekly sailing sessions for a local disabled group. Heather started sailing at age 7 and became a dinghy instructor by age 16. In her spare time, she volunteers with everything from kids club sailing to the adult and disability courses. For the past two years, Heather has also volunteered as a watch leader on the sail training vessel James Cook, run by Ocean Youth Trust North, and has given the majority of her school holidays and many weekends to helping groups, and gaining experience of offshore sailing around the UK’s west coast. The Andrew Simpson Sailing Foundation was founded in memory of, and inspired by, Olympic Gold Medallist, sailor Andrew “Bart” Simpson. Primarily for young people aged 5 to 24, the foundation uses sailing as a means to develop skills and provides opportunities for any young person, regardless of financial or social position, to experience the challenges and education provided by sailing. Follow the Andrew Simpson Sailing Foundation on Twitter and Facebook for Charlie and Heather's blogs as they prepare for the race of their lives, and view the photo album of the prize announcement here.